In THE SHOCK DOCTRINE, Naomi Klein explodes the myth that the global free market triumphed democratically. Exposing the thinking, the money trail and the puppet strings behind the world-changing crises and wars of the last four decades, The Shock Doctrine is the gripping story of how America's "free market" policies have come to dominate the world-- through the exploitation of disaster-shocked people and countries. At the most chaotic juncture in Iraq's civil war, a new law is unveiled that would allow Shell and BP to claim the country's vast oil reserves.... Immediately following September 11, the Bush Administration quietly out-sources the running of the "War on Terror" to Halliburton and Blackwater.... After a tsunami wipes out the coasts of Southeast Asia, the pristine beaches are auctioned off to tourist resorts.... New Orleans's residents, scattered from Hurricane Katrina, discover that their public housing, hospitals and schools will never be reopened.... These events are examples of "the shock doctrine": using the public's disorientation following massive collective shocks - wars, terrorist attacks, or natural disasters -- to achieve control by imposing economic shock therapy. Sometimes, when the first two shocks don't succeed in wiping out resistance, a third shock is employed: the electrode in the prison cell or the Taser gun on the streets. 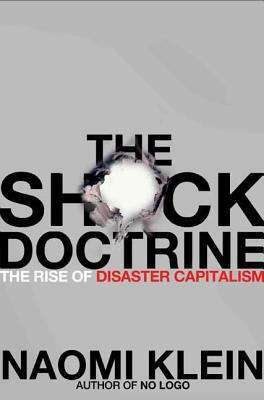 Based on breakthrough historical research and four years of on-the-ground reporting in disaster zones, The Shock Doctrine vividly shows how disaster capitalism - the rapid-fire corporate reengineering of societies still reeling from shock - did not begin with September 11, 2001. The book traces its origins back fifty years, to the University of Chicago under Milton Friedman, which produced many of the leading neo-conservative and neo-liberal thinkers whose influence is still profound in Washington today. New, surprising connections are drawn between economic policy, "shock and awe" warfare and covert CIA-funded experiments in electroshock and sensory deprivation in the 1950s, research that helped write the torture manuals used today in Guantanamo Bay.